To justify an offshore wind project’s economic viability, an accurate preconstruction energy yield estimate is required. Unfortunately, the behavior of the wind in a marine/coastal environment is complex, and often not well measured, modeled, nor understood; thus significant preconstruction energy yield uncertainties may be introduced when estimating a local wind resource and a turbine’s available power. In part, such uncertainties contribute to the chronic industry challenge known as wind farm underperformance bias, in which operational energy yield is less than preconstruction expected energy yield. The consequence of underperformance bias is noteworthy, as an inaccurate expectation of available wind and turbine power may cause sub-optimal wind farm layouts, thus further delay the offshore wind cost-competiveness. The University of Maryland, Baltimore County (UMBC) atmoSpheric Profiling for Advancing offshoRe wind researCh (U-SPARC) team was established in 2013 with a focus on reducing atmospheric-related energy yield uncertainties that contribute to sub-optimal offshore wind farm performance, thus unintended high costs. To address these uncertainties U-SPARC’s research is divided into 4 themes: “Research-2-Operation” (R2O), “Measurements-2-Models” (M2M), “Offshore Wind farm Layout” (OWL), and “Doppler Lidar Uncertainty” (DLU). The R2O team collects high spatial and temporal resolution atmospheric measurements offshore to develop methodologies that more accurately characterize the wind resource and available turbine power. The goal is to elucidate how unique Mid-Atlantic coastal meteorological conditions influence offshore turbine performance. The M2M group works closely with R2O, using measurements to validate and improve model estimates of the offshore wind resource. 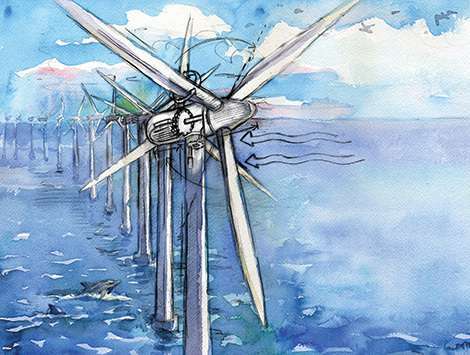 OWL research uses both R2O measurements and M2M model results to investigate optimal turbine design and layout strategies that maximize offshore wind farm energy yield. Finally, DLU works to quantify Doppler wind lidar measurement uncertainty and provide insight on appropriate measurement strategies in an offshore environment. To support these objectives, the U-SPARC team collected high spatial and temporal resolution Doppler wind lidar measurements within Maryland’s offshore Wind Energy Area, during the Maryland Energy Administration sponsored geophysical survey (summer 2013). Currently, using continuous wind lidar measurements in Ocean City, MD, a long-term offshore wind resource reference database is also being constructed and the uncertainty of Numerical Weather Prediction (NWP) modelled wind estimates assessed. To better account for uncertainties introduced from remote sensing wind retrieval techniques, U-SPARC scientists participated in the Experimental Measurement Campaign for Planetary Boundary Layer Instrument Assessment (XPIA) and Lidar Uncertainty Measurement Experiment (LUMEX) campaigns, funded by NOAA and DOE-NREL respectively. Most recently, in partnership with the University of Delaware, U-SPARC was funded by the National Science Foundation (NSF) to investigate coastal turbine performance and its wake effect phenomena using wind lidar measurements around a 2 MW turbine in Lewes, DE (Vertical Enhanced Mixing Measurement (VERTEX) campaign).